Before I did what I do now I worked as the HR Director at management team level for a number of blue chip organisations. I was privileged to receive some world class training in a number of different areas; one of which was bullying. I will never forget the ACAS definition of bullying that was instilled in us at the time: Bullying is an act designed to undermine, humiliate and intimidate. Those three words were so well thought through, so appropriate and so precise. Make no mistake – today’s hatchet job in the Mail on Sunday is an attempt to undermine, humiliate and intimidate me, Dr Aseem Malhotra and Dr Malcolm Kendrick. On Thursday evening (28th Feb 2019) I received an email from Barney Calman. I have lunched with Barney. He has received my Monday note for years for free. I have helped him with numerous articles and quotations for free (I think I received a tiny contribution following one nightmare article). If you read just the words in black below, you will be able to see the email that I received. I was given until noon the next day to respond. Aseem and Malcolm received almost identical emails and were given similar deadlines. Aseem didn’t bother replying – his view was that they’re going to print what they wanted to anyway, so why bother. He was right. Malcolm and I did reply. The words in red below are my reply. The Mail on Sunday plans to publish an article this weekend on growing concerns about claims you and a number of other individuals have publicly made about statins, the role of cholesterol in heart disease, and the allegations that researchers into the drugs are financially conflicted due to payments made to the organisations they work for, and so the evidence they provide about the effectiveness of these medications, and their side effects, are in some way untrustworthy. Over the past 30 years, more than 200,000 patients have been put through the most rigorous forms of clinical trials to produce definitive proof the tablets lower heart attack risk by up to 50 per cent, and a stroke by 30 per cent, and reduce the risk of death – from any cause. ZH comment – these are relative risk numbers, not absolute risk. Following the 2012 CTSU publication about statins (Ref 1), I wrote to the research team asking for access to the raw data so that I could examine absolute risk (among other things). I was refused access to the data. The exact reply was: “The CTT Collaboration holds data on a very strict basis and is not able to provide participant level data to third parties” (Ref 2). The Editor in Chief of the BMJ, Dr Fiona Godlee, has asked for an independent review into the withholding of statin trial data arguing that “no single person or group should have exclusive access to data” (Ref 3). In the absence of access to the CTSU data, we must rely on the independent assessment of all evidence for the efficacy of statins presented in the form of numbers needed to treat (an absolute measure). This reports that, for primary prevention (the majority), for those taking statins for 5 years, no lives will be saved and between 2 and 15 times as many people will be harmed (muscle damage, type 2 diabetes) as helped (avoiding an event) (Ref 4). 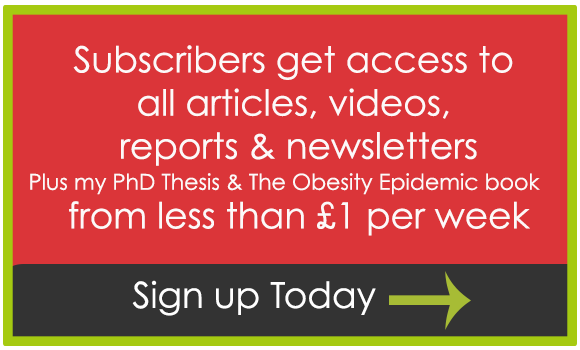 A 2016 analysis from the London School of Hygiene and Tropical Medicine, which tracks outbreaks and public health concerns, found fake news about statins may have prompted 200,000 patients in Britain alone to quit the drug over a single six-month period following an article you wrote for the BMJ which claimed, incorrectly, that 20 per cent of statins patients quit the drug because of side effects. ZH comment – I have not written any articles in the BMJ (or any other journal) about statins. *You recently blogged: ‘High cholesterol is not even associated with high heart disease, let alone a cause of it.’ This contradicts the aforementioned clinical trials and encourages patients to ignore medical advice to take potentially life-saving (ZH comment – no lives will be saved – see above) medication. ZH comment – this is a fact. 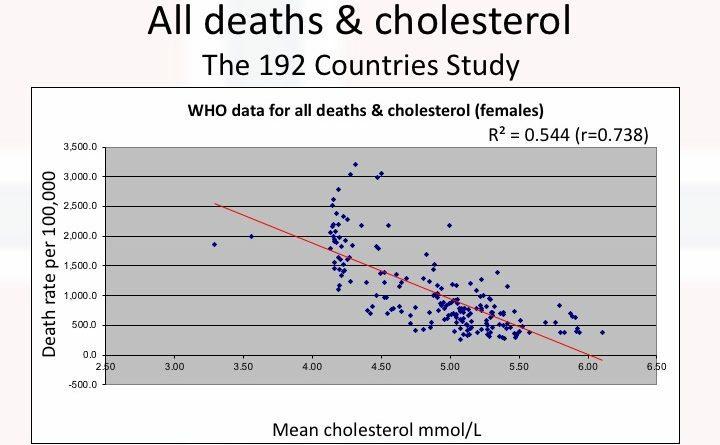 High cholesterol is associated with low mortality – from cardiovascular disease (CVD) and deaths from all causes – for all 192 counties in the world. 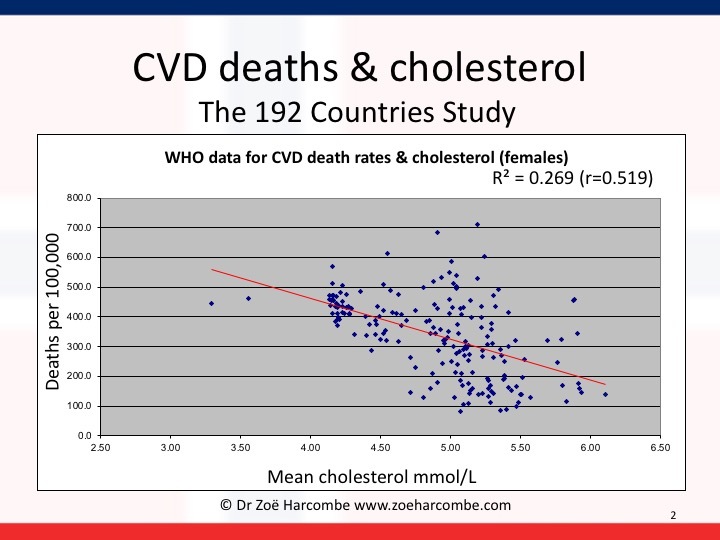 In 2010, I examined the World Health Organisation data for 192 countries for mean cholesterol levels and deaths from CVD and all-cause mortality for men and women. 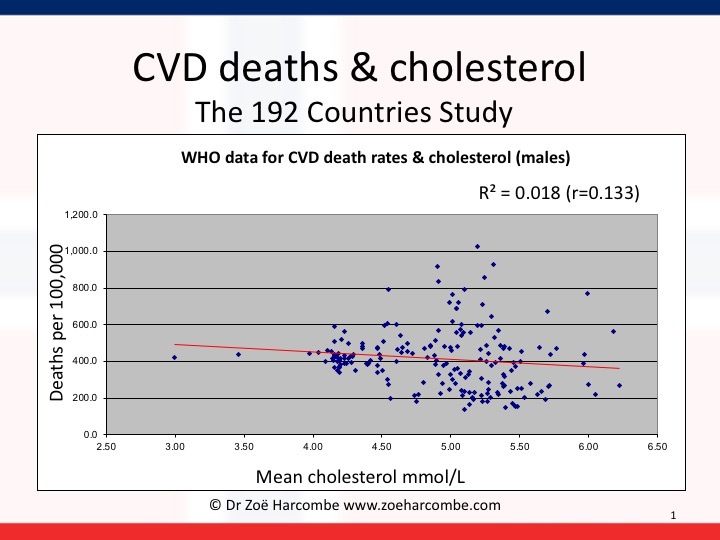 The relationships turned out to be inverse, for men and women, CVD and all deaths, as shown by these graphs (Ref 6). *In a 2014 newsletter you call cardiologists, researchers and bodies involved in statin research ‘statin pushers’ – echoing the term drug pusher, or someone encourages others to take harmful drugs and who makes money supplying those drugs. You appear to justify this by listing those who have received remuneration or funding in some form or another from pharmaceutical companies. 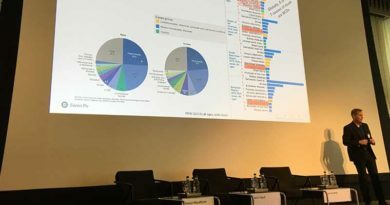 ZH comment – any attempt to connect any topic to the MMR vaccine scandal is a deliberate and nasty attempt to smear. Rory Collins heads up the CTSU/CTT Collaboration – the organisation that refuses access to data that could improve patient care. 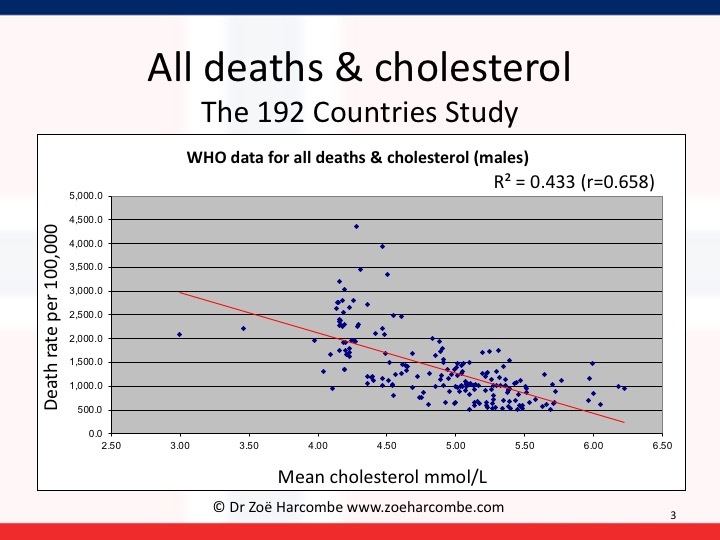 Rory Collins made this association in a deliberate and nasty attempt to smear anyone who even wants to discuss cholesterol and/or statins (Ref 7). He is trying to bully doctors and researchers into silence and the Mail on Sunday is collaborating with this bullying. Collins tried (and failed) to have two papers withdrawn, which referenced another paper that quantified statin side effects (Ref 9). During the investigation into Collins’ demands for retractions it emerged that, as of 2014, the CTSU had received £268 MILLION from the pharmaceutical industry (perhaps the Mail on Sunday could find out how high this figure is now?) (Ref 10) That’s 268 MILLION reasons to silence debate. The Mail on Sunday should be investigating this Goliath conflict of interest, not a couple of ‘Davids’ who are brave enough to ask questions. Collins claims that not more than 1 in 50 people will suffer side effects from statins (Ref 9). The same Collins has a patent that identifies patients at increased risk of myopathy (muscular pain). “The test, branded as Statin–Smart, is sold online for $99 (£76) on a website that claims 29% of statin users will suffer muscle pain, weakness or cramps. The marketing material also claims that 58% of patients on statins stop taking them within a year, mostly because of muscle pain” (Ref 11). That’s misinformation. The patient leaflet must be honest, by law, about side effects. The patient leaflet for Lipitor lists common side effects, which may affect up to 1 in 10 people, as: nasal inflammation; nose bleeds; increase in blood sugar levels (google “statins diabetes lawsuit”); gastric problems; joint pain; muscle pain; back pain; abnormal liver function (Ref 12). This is the harm that Collins wants silenced. Lipitor, by the way, has earned Pfizer, one of the CTSU funders, $149 BILLION by 2016 (Ref 13). ZH comment – whom to trust – the public should trust those who are not earning £MILLIONS and $BILLIONS, while refusing to share invaluable data. Data that could improve patient care. *You often quote observational studies as proof of your claims about statins and cholesterol in articles and blog posts which contradict findings of authoritative clinical trials, which you do not mention. This is misleading. ZH – give me an example? *Your stance on statins and the link between cholesterol and heart disease amounts to misinformation. ZH comment – This is a false accusation and I will take further action if you make false accusations. 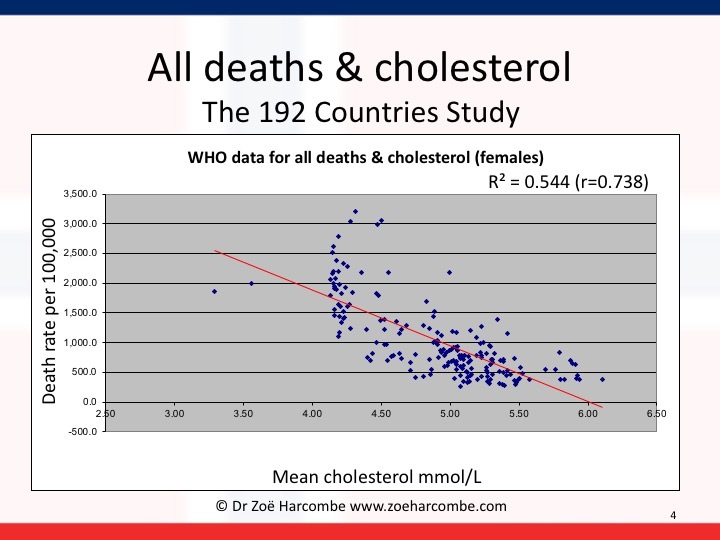 I have examined the entire data provided by the World Health Organisation and found that higher cholesterol is associated with lower deaths, from CVD and all-causes, in men and women, for all 192 countries in the world. My PhD was an examination of the diet (cholesterol) heart hypothesis. Cholesterol is mentioned 612 times. I have studied this topic at the highest level for several years and I am entitled, if not obliged, to share what I have found. I’ll tell you what misinformation is – on 1st February 2019, a paper was published in The Lancet by the CTSU/CTT Collaboration (Ref 14). A press conference was held to launch the paper. The lead CTSU author, Colin Baigent, was quoted as saying: “Only a third of the 5.5 million over 75s in the UK take statins and up to 8000 deaths per year could be prevented if all took them.” This is false. It relies upon evidence in the over 75s for both deaths and primary prevention and neither was found. Figure 5 of that paper confirmed that the Rate Ratio for deaths in the over 75s was not statistically significant. Figure 4 of that paper confirmed that the Rate Ratio for primary prevention was not statistically significant. I have written to the authors (through The Lancet) asking why they have claimed something that they did not find. I have received no reply. The public should also have been warned that the patient leaflet for statins cautions against people over 70 years old taking them (Ref 12). Another example of misinformation (in addition to that above on side effects) is the continual use of relative risk numbers to scare people into taking statins. You reiterated this misinformation above “lower heart attack risk by up to 50 per cent, and a stroke by 30 per cent.” The absolute difference, even for secondary prevention, for those who manage to take statins for 5 years, is 1 in 39 for a heart attack and 1 in 125 for a stroke. Meanwhile 1 in 50 were harmed by developing type 2 diabetes and 1 in 10 were harmed by muscle damage (Ref 15). Withheld information is also an issue here. The information being withheld by those running the trials for the pharmaceutical industry is the scandal. Patients are being harmed by not knowing true benefits and true side effects. The Mail (on Sunday) has always been a bastion for debate – you’re asking the wrong questions of the wrong people on this one. *If you wish for any comments to be included in our article please send them to us by midday this Friday. ZH comment – Not least as someone who has freely assisted the Mail/Mail on Sunday with many articles and quotations, I expect to be treated fairly, with balance and not quoted out of context. We should be flattered – the might and wealth of the Oxford statin Clinical Trial Service Unit and the might and wealth of the Mail on Sunday deem it necessary to try to silence three individuals. But then, when one statin alone has earned one company $149 BILLION, the motivation to end debate is clear. p.s. both Malcolm and I mentioned this 2015 study. The response in the article from Colin Baigent at the CTSU on this point was highly amusing. He said: “The 2015 study Kendrick mentions only looked at life extension over the trial period of a few years. Statins are lifelong drugs, and the extension of life over a lifetime will be very much greater.” So multiply 3-4 days for every 5 years that you manage to take statins and that’s your potential gain. Then weigh that up vs. the side effect pain for multiples of 5 years. ← Is a vegan diet safe for infants and children? Thank you for standing up for what you believe in. Not every scientist with a PHD can sleep well at night. I used to work for for a large pharmaceutical company manufacturing asthma drugs. Why would they find a cure when you make far more money treating the disease for a lifetime. There’s too much emphasis on profit. The CEO, sales staff and share holders thrive on profits. Healthy customers don’t need their services. I miss your weekly newsletter. But hey! YOU, ASEEM and MALCOLM are briliiant! As for that brown nosing british upperclass aspiring bullying rubbish I am wordless. Does any one do fact checking at that rag? Do they belong to the conway school of “alternative facts? I am so glad I do not live in the UK. We have some pretty rubbish media but nothing quite as bad as that, or your other tabloids. Why not spread a conspiracy theory that the rag published this nonsense to deflect from concerns about (sorry, snigger) brexit. The entitled would not do such a thing! Hah! Could you please provide me with the title, date, etc of your dissertation so that i can obtain a copy of your dissertation. Even better is there a way to read it online or through some other source. I’ve just been diagnosed with high cholesterol and possibly FH. Like so many I’ve just begun to try to understand something more about it so that I might do the right thing for myself. What I have learnt very quickly is that its very confusing, and that my Dr’s feel keen to want to prescribe statins – which we all know come with warning labels! 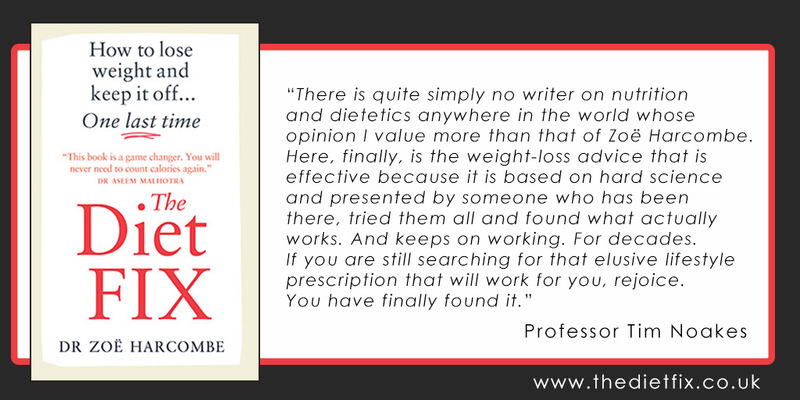 So since January I’ve been looking at diet, and exploring LCHF, and have found myself beginning to look at a range of health literature which has led me to your site Zoe, as well as a handful of other experts. My mum also is in the same health situation as myself and she told me about the DM article. I’ve since revisited the DM remembering that every so many months they do a flip flop article… one month they’re all over statins, the next they’re all for controlling it through diet. As another commentator just mentioned… it is scary to read, but it isn’t difficult not to trust a paper which simply can’t make up its mind. I was surprised at how scathing the article was and am delighted that you’ve presented such a robust retort! Thank you for sharing your work and presenting it with integrity. I look forward to learning more. This is exactly what a Statin drug does, it interferes with the normal production of life-supporting cholesterol, so why can’t the Public recognise that fact even if their own GP cannot? I have been prescribed statins twice in the last 10 years. First time I was taken off them within 6 weeks after I developed a reaction which could only be attributed to the statins. The second time I was taken off them within 3/4 days as I developed really bad headaches and nose bleeds and again they could only be attributed to the statins. I have followed your eating plan for about 2 years now and my cholesterol levels have fallen to a ‘perfect’ level. Keep believing and defend your corner. The truth will come out. Thank you very much for replying. I had already read Malcolm Kendrick’s article about statins, inflammation and nitric oxide which was why I was asking your opinion, just out of curiosity, on the benefits of statins for somebody on a highly inflammatory diet who has no intention of changing his ways. The person to whom I refer has no obvious statin-related health problems except what Sally Fallon (I think) calls the “statin shuffle” which he puts down to old age. I glanced at the Mail on Sunday comments: it seems that many people are aware of the case for cholesterol and against statins which is reassuring. However I have one question. Would someone who is unwilling to change either diet or lifestyle benefit from statins? Someone who really is not interested in evidence about saturated fat being good for you and so on? Would the anti-inflammatory properties of statins help to keep such a person alive? I know somebody in his seventies who eats too much, drinks too much, had a heart bypass operation twenty years ago and has been taking statins ever since. I wouldn’t say he is in radiant health and brimming with vigour, but he has no noticeable side effects from the statins – at least none that couldn’t be put down to the drink. Is this person well-advised to be taking a statin? I really would like to hear what you think. As the post shares above – take statins for 5 years and you might gain 3-4 days – and that will likely be from the anti-inflammatory effects and effect on Nitric Oxide (see Kendrick’s work) with the cholesterol lowering being the unfortunate side effect (among others). What can I add? Just another message of support and encouragement and appreciation for all you do. I suspect The Mail on Sunday have no idea who they have taken on! You all have such a huge amount of supporters behind you. I wish you all well and will follow this story with interest. Great response Zoe. Dr Mckendrick’s reply to them was spot on too. They ought to hang their heads in shame. Keep up the good work. Just one more point from this risible article is the scathing way it refers to Zoë as an ‘academic’ (rather than a medic). Yup, Zoe’s an academic all right – which means she’s exceptionally well read in her field, an excellent analyser, a rational conclusion-drawer and brilliant writer/explainer as per her publications and presentations. She is open and transparent about the data she has evaluated (unlike the ‘academics’ clinging to the opposing view). She has thus obtained a PhD and is widely respected internationally. She’s certainly about a thousand times more qualified to opine on this subject than Barney ‘special-place-in-hell’ Calman, who ignores the evidence-based Kendrick/Harcombe rebuttals in his partisan hatchet-job in a sensationalist paper. Give me an academic of Zoe’s calibre any day, rather than this sorry example of prejudiced journalism. Remember it’s tomorrow’s chip-paper. Thanks again Splotchy – twitter found out that Calman has a degree in fashion promotion. That’s probably why he started his nastiest piece with the words “statistics are one thing” – he clearly doesn’t understand them! One of my friends said – do you admit you’re not a professional footballer too?! In 2009 the “Daily Mail” published a piece by me (at least, it had my name over it, but it was ghostwritten) Explaining why statins were not as great as they were cracked up to be. Quite a change of tack, then, especially as the evidence for the cholesterol-heart hypothesis is being undermined daily. The recent paper (Efficacy and safety of statin therapy in older people: a meta-analysis of individual participant data from 28 randomised controlled trials) raises a number of issues. 1. The list of conflicts of interest is substantial, and the prime mover of the “research” has benefited greatly from funding by statin manufacturers. 2. The raw data for the trials analysed are not available for inspection by any independent source, as the Oxford Unit refuse to release these despite repeated requests. 3. Thus the only holder of these data makes conclusions that cannot be verified. 4. There are a number of apparent methodological errors. This review analysed data from 28 trials, but only 14 of these are fit to be included to answer the question being asked, and one of these is authored by the very people conducting the review. 5. 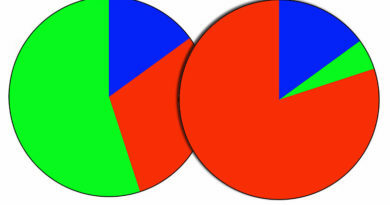 The reported percentages for deaths do not match the quoted absolute numbers of subjects. 6. The statistical methodology is designed to obfuscate and confuse and it is unscientific to reappraise trials in this way. 7. The data that are presented anyway make a very weak case for statins. The overall absolute risk reduction for mortality – which is shown in the paper – is just 0.1%. It is brazen to conclude, as has been quoted in the media on the basis of a press release, that 8000 deaths a year will be prevented by statin treatment. I believe there are sufficient concerns to request that the paper is retracted. I have not received any reply. Many thanks for sharing this Andrew – I’m also waiting for a reply to my email to The Lancet! Let’s not take statins while we’re waiting eh! I would like to cordially invite you to join a UK FB group: Stopped Statins. 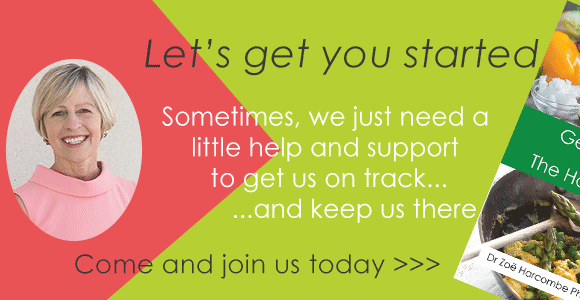 Here ‘real’ people openly share their problems, side effects, support mechanisms and share how they managed to get back to as normal as possible life, some after suffering devastating problems. Are you up for it? Come join and see what statins really do to the human body. Interesting that you say your brain “did not function properly”. I’ve had a couple of friends taking statins who developed serious cognitive impairment. One had to retire early — at considerable financial loss — because he couldn’t function. He was initially diagnosed with Alzheimer’s, his wife started doing some research and came across evidence of statins causing cognitive decline. She stopped giving him his statins and, while he never recovered fully, he did regain much brain function. Yet all the emphasis on side effects is on the muscle pain and type 2 diabetes risk. Sending love and support from the land down under. If their product (statins) are so wonderful, why are they so keen to shut you up? A lot of the comments at the foot of the article seem to be from people who have had problems with these meds. Why won’t Collins and co publish all the data? The Mail journo and the paper must have been paid a good sum of money? I shall continue to follow yourself, Dr Malhotra and Dr Kendrick, good wishes and thanks to you all. Don’t stop putting pressure on them, Zoe. You are my inspiration, so clever and articulate. I have learned so much from your blogs and books. I echo all the above, but just wanted to add one extra thing: You look stunning in that red frock. I’m reasoning you follow the nutritional advice you advocate. Plus you’re in good company with Malhotra & Noakes also mentioned. Slowly you are gathering momentum in your lifesaving work. Ha ha – thanks Splotchy! It was a Victoria Beckham – one of a few options arranged for a photo shoot with The Times. I got to wear it for 2 hours only – not sure I’d wear that out anyway! The very use of the word “deniers” smacks of propaganda. This is just the bullies with their backs being pushed against the wall. As a health care provider promoting the LCHF way of life, I stand on the back of giants like yourself, Tim Noakes, Gary Fettke, Caryn Zinn and others. I am a Canadian Registered Dietitian with a private practice to teach LCHF and I want you to know how much your work, and your courage in standing up against the conventional wisdom, means to the rest of us. We will prevail – the tide is slowly turning, but boy, it’s hard to paddle against the current. All the best to you going forward. The Mail piece is a disgusting one-sided hatchet job, which brings together all the people that definitely have a dog in the statin race and allows them to spout talking points and arrogantly dismiss criticism without bringing real evidence to counter the valid points that you, Malcolm, Asseem and others have raised. As a research scientist myself, I was particularly annoyed by the comment that you “admit” to being an academic (or some such phraseology) like you were admitting to witchcraft or something. Who the hell do they think do these drug trials, professional scientists that’s who, aka. academics. On another note I saw the statistic (from Rory Collins I think) that 1 in 10000 people get muscle and other problems on statins. Well I don’t know how many are on statins in the UK; say 5 million, making a potential cohort of 500 people with issues. Amazing how a good proportion of that entire cohort seem to have turned up to comment on the article. The number of people who have now commented on their own adverse side effects after the Mail piece should make any genuine researcher wonder if the 1 in 10000 is a hefty underestimate. I wonder if the author is feeling a bit daft this morning? Yes I noticed that too, well it was hard not to. yet another example of the crap “journalism” of the Mail being faced down by knowledgeable responders. I was lucky not to get ANY side effects from statins (I stopped and restarted them a couple of times to make certain). I stopped them for good when I discovered how they work – they shut down the entire mevalonate pathway just to reduce LDL, thereby reducing a whole bunch of other important chemistry. It’s little wonder that the actual level of side effects is so high. When statins came off patent and PCSK9 inhibitors were invented (there’s a coincidence!) I convinced myself that they would throw statins under the bus to replace them with the hugely expensive new drugs (which also appear to have little effect on mortality/morbidity despite dropping LDL into the basement). It seems I have misunderstood economics. Though statins are an order of magnitude less profitable they have decided to prescribe them to even more people. I wonder if they will bring back Dr Reckless (yes really) and his scheme to put them in the drinking water, while making meat illegal with the other hand. Hi Chris – Sarah Bosley, Guardian, fell for this one too. She wrote a piece essentially suggesting that they were cheap as smarties, so what’s the issue in getting more people on them? Because the HUGE prize is not statins – PCSK9s will make the $149 BILLION from one statin look like pocket money – but people will need to be on statins to be in the pool for PCSK9 consideration. I think that’s why they want the statin pool as wide as possible. Zoe I was so encouraged to see the parliamentary speeches re LCHF in Feb brought about by Tom Watson. Hoping your speech will be available too. This is a massive breakthrough, the statin brigade are running scared and are desperate to defend their disgusting profits. The crusade is building, if the truth is not revealed soon to the masses the government will be guilty of genocide! Hi Gill – many thanks for this – yes – my video should be up soon I think. Follow Ivor Cummins (@FatEmperor) on twitter – he is doing them. Zoe, there is something I’m not seeing in this discussion that I feel is relevant. Everyone knows there is HDL (the good cholesterol) and LDL (the bad cholesterol). Many are not aware of the two varieties of LDL: Pattern A (fluffy, buoyant) and Pattern B (small, hard, and dense). The VAP blood test measures the two constituents of LDL and the greater the percentage of Pattern A, the less the risk of a cardiovascular event. So you can have “high” total cholesterol with minimal cardiovascular risk if the VAP test is not performed. How many doctors order the VAP test to obtain a clear understanding of the risk of CVD? In my experience, hardly any doctors order this test unless specifically requested by the patient. It looks to me like another piece of evidence indicating that Big Pharma is exploiting the public. Thank you for being the voice of reason in a hostile, chaotic, irrational world. I don’t think the VAP test is emphasized enough. Even my GP (who is a statin “pusher”) had to admit that my VAP test which showed a prevalence of Pattern A LDL was a reasonable reason for me to not take statins. That and a zero calcium score twice in 5 years! This affinity for prescribing prophylactic statin for simple “high” cholesterol is fallacious on the surface. You can get some estimation of the size and density of the LDL particles from the trigs/HDL ratio which is also a marker for insulin resistance and cardiovascular risk. I notice a lot of people can no longer get the result of their trigs, which is ridiculous as it has to be measured to calculate LDL. I assume there is an el cheapo lab analyser which is widely used. Our nurses can only do a test which gives “cholesterol” and a “Ratio”, you have to see a doctor for the full Monty. Worse still the lab the doctors used to use gave measured rather than calculated LDL – I could tell because my result was halfway between the Friedwald and Iranian calculations. Probably the reason for no longer giving the trigs, along with not using NMR or VAP, is because “we don’t have a drug for that”. I doubled my HDL and dropped my trigs to a tenth of what they were by eating the exact opposite of what the dietician told me. Initially my LDL went up. then came back down when I lost the weight the dietician made me gain. As Dave Feldman has shown (cholesterolcode.com) LDL can change drastically in a short period of time thus making it a rather insensitive test, and that’s even if you think LDL is a meaningful thing to measure. Here’s a further clue: my LDL dropped by exactly the same amount as the statin when I went hyperthyroid, and when overtreated (hypothyroid) it shot up. I was told by a retired consultant that when they saw high LDL they would do a TSH test, but this link disappeared when “metabolic syndrome” became so common. So hyperthyroid is heart healthy? I think not. The article in Daily Mail reminds me of good old communist propaganda – there is only one right way of thinking and the biggest offenders must be named and shamed publicly. Well, shame on you Daily Mail! However, this is really no laughing matter. Please don’t ever stop your questioning and research Zoe, you and the other great ‘deniers’. There are thousands of books out there with ridiculous recommendations. I remember vividly being upset by a series of “meditate your pain away” themed books about a decade ago. Until all non-mainstream suggestions are banned, yours. should stay. I want to hear them. The most insulting part of this for me is that “they” think I can’t decide for myself what to think. This is thought-cleansing and should be opposed by every rational human being. Well this was predictable – the nastiness was always on the cards. When those with huge vested interests feel threatened they start to hit out. But bullies never win in the end. Keep the faith Zoe et al!! PS I agree with you – the MoS article is going to backfire on them. I took statins for a month because I was told I had FH. My heart raced sufficient to wake me at 4am ever morning. Every muscle ached and my brain did not function properly. Finding your site and that of Dr Kendrick helped me to follow my instincts and decline to try a third flavour of statin. I am so grateful that people like you and Malcolm Kendrick do not hide the facts and do not follow the party line. What you say “So multiply 3-4 days for every 5 years that you manage to take statins and that’s your potential gain.” is actually incorrect, as I pointed out to Dr. Kendrick. Kristensen et alter only estimate the average survival gain achieved by everybody on the treatment arm (dead or alive) within the trial’s running time. Yes, that means all survivors to placebo are contributing with the value ZERO to that average bringing it down. I explain it thoroughly here. Hi Andres – thank you so much for this – I’ll take a good look later – I can’t keep up with the lovely messages of support coming in on text, what’s app, email, twitter! Well, as I commented on Malcolm’s post, I’m almost 56, 5’6″, 52kg and free of medication, of any sort, even though I am supposed to have FH. No headaches, no colds, no allergies – nada. Oh, and I look as though I’m in my forties. 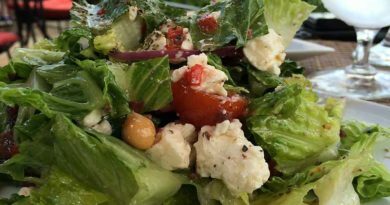 19 years ago, after several years of myalgia, I attempted ‘suicide’ (lol) by giving up statins and adopting a low-carb lifestyle – which became keto 5 years ago. My cholesterol is sky-high, but all other markers are within normal ranges. I’d love to still be here at 100 just so that I could prove these corrupted swines wrong. I will forever be indebted to you, Asseem, Malcolm and WDDTY for opening my eyes back then and continuing to do so. Keep going Zoe. You helped me at a time where i was being made to take statins,but had horrible side effects and not being believed. I have now stopped worrying about it. You have been a breath of fresh air for me and i always look forward to my weekly articles from yourself. Keep up the good work Zoe and fellow ‘deniers’. My mother in law has developed type 2 diabetes, dementia and is crippled by having statins forced on her for over 30 years. Sadly her generation never questioned what the gps prescribed and never liked to complain about muscular pain etc, believing everything that the doctor told her. Thank goodness we have researchers like you to open our eyes and give us a voice. Hi Zoe, keep it up. As a scientist what I really really hate is the use of the word “denier” Science is littered with “deniers” who were subsequently shown to be correct. I think a rational non emotive debate about the use of these drugs is a good thing and if the government is truely concerned about this issue then a comprehensive trial should be funded (government funded – no pharma, or conflicted medicos/scientists) to get to the truth. All data generated should also be open to external analysis which is required in science. In actual fact no papers should be allowed without the data being available for independent analysis. Keep it up, don’t let a crap news paper article get to you. We desperately need open and honest science, not influenced by bias and vested interests. After all, if Dr Barry Marshall had to take a high risk by drinking Helicobacter to prove his point, the medical field would still be doing vagotomies to treat stomache ulcers. Before his experiment, he could not have his research accepted at a conference as a poster. Zoe, apart from the appalling standard of journalism of the Daily Wail (get your daily dose of Envy, Lust, Hate, Fear and Outrage here), you committed a cardinal sin; that of a woman questioning the intelligence of middle-aged, middle-class white males! Ah, the good old MoS. Click-bait being their aim, they know that it doesn’t pay to be too scrupulous about it. At least you’re in the main section, Zoe, not the dreaded ‘side-bar of shame’ – when you’re promoted to that, it will be something to worry about! In the meantime, brava, and keep getting the word out there. The tide is surely on the turn, and no surprise that the vested interest merchants are feeling defensive, and want to get their retaliation in first. Hi Alison – you’re too kind! If I don’t end up in the side bar with that Victoria Beckham dress, I never will! Yes this is just the first of many attempts at internet and media censorship and vilification of anyone who dares to question the safety and/or effectiveness of medications, particularly those which are prophylactic i.e. aimed at preventing disease and illness, including vaccines, and medicines like statins, which reduce cholesterol. Basically, these products involve mass medications of targeted populations, including healthy individuals. Statins do cause side effects in some persons, particularly pains in the legs. This is well documented. A lower dose might solve the problem, but this MUST be resolved by discussing the issues with the patient’s GP. Patients have a legal right to be properly informed about all the risks as well as the assumed benefits of any medication or medical intervention. I found the articles in The Mail on Sunday to be quite scary and indicative of a totalitarian attitude to UK citizens and their legal health rights. Appalling! Shame on Barney Calman and Shame on the Mail on Sunday.